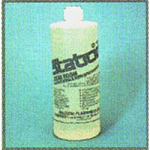 Ready to use, non-toxic, non-flammable safe to use. Wipe on surfaces to reduce or eliminate static. Ready to use, non-toxic, non-flammable safe to use. Features » Wipe on surfaces to reduce or eliminate static.